Steering Cables - Steel or Stainless Steel ? well I was doing a little boat yoga in the Lazzerette. Think the pose was sailor changing raw water impeller. Anyway looks like my steering cables have one or two fishhooks. It looks like the cables are regular steel but all greased up. Though I'm not 100% sure and the grease is dark and so is the cables. So should I replace them with steel 7x19 or stainless steel 7x19. I think the cables are probably original and almost 40 years old. Stainless is about 10 times the cost of regular steel cables. Being that the old cables made it this long, I'm leaning toward plain steel cable and just grease it up. What does the collective think??? Stainless. Gal wire is cheap, but do you really want the rust stains associated with it. Unless you feel like crawling under the cockpit with cans of lanolin every six months. Re: Steering Cables - Steel or Stainless Steel ? Just replaced mine. Stainless. Good for the next 40. 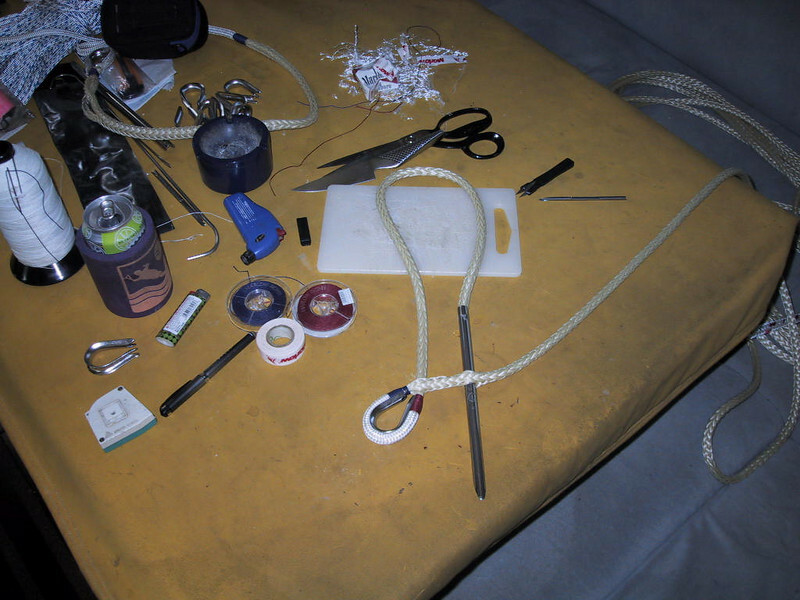 I have replaced a lot of my wire lines with dyneema. Fantastic. 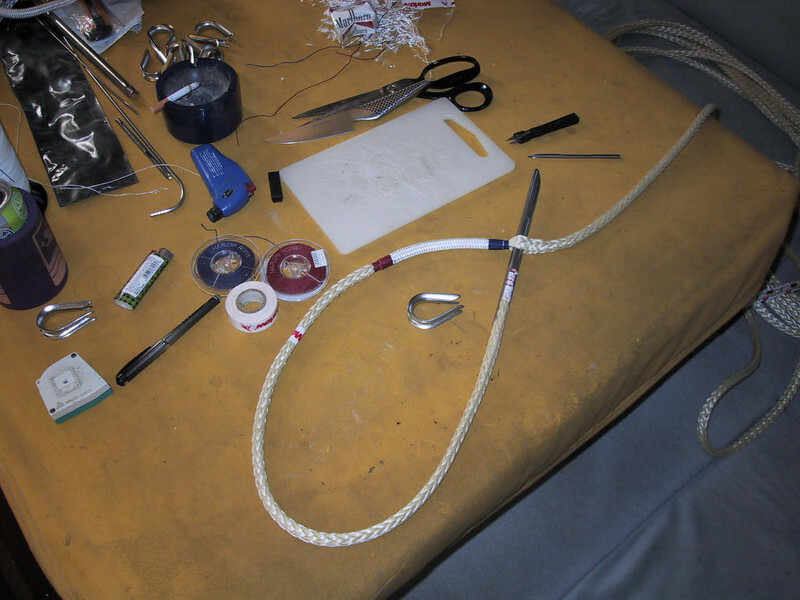 I am wondering if anyone has used dyneema as a steering cable replacement. That should be ideal. No? If you can get in touch with the original maker of your steering then they may be able to advise. Otherwise measure the diameter of all pulleys and pull your cables off. 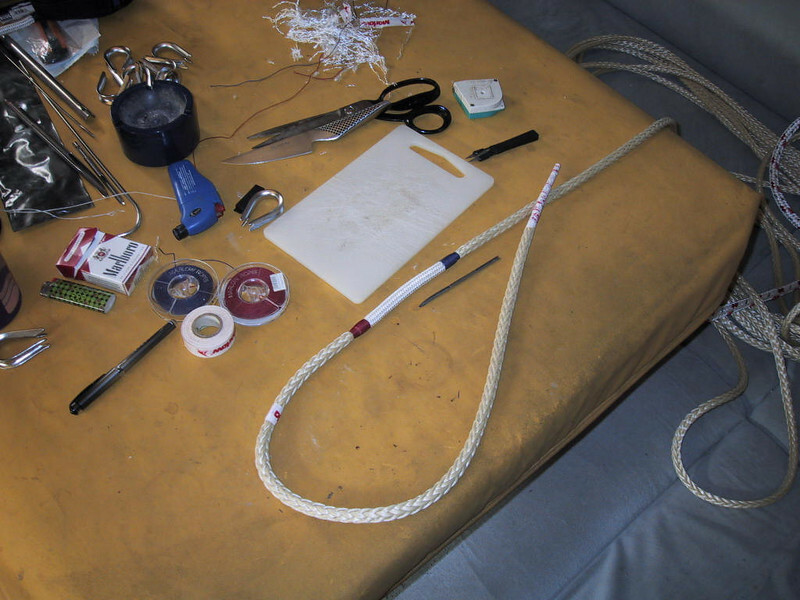 Take them to your rigger and ask them to make up replacements. They should know the right type and size of wire. Do get new clamps at the same time. If the wire is too large for the pulley diameter then the steering may be stiff. Don't forget to visually inspect all parts of the steering for damage, particularly the chain ends and cog. Do lubricate the bearings (Your rigger should have recommendations). Going to disagree with some of the above posts. If the steering cables are the normal, internally run cables, then galvanized will far outlast stainless. Galvanized steel has superior fatigue properties to stainless. It it fatigue, from being bent as it runs around the pulleys, that has caused the fishooks you're seeing. Galvanized steel will run far longer without fishooking. Cover it with a good grease and it will both last longer and save you a good amount of money. I did mine using Amsteel blue. excellent result. made 2 so there is a spare. I found it initially has a little stretch so for the first few weeks I check it and tension it. I have old style edson quadrant and the steel cables have to make a fairly sharp turn onto the quadrant. Grteat place for stainless to fail. the round quadrant would be an improvment. The amsteel looks like new I think its in its 3rd year. You weren't hoping for a consensus were you? I would talk to a rigger about your choices and ask him about Amsteel blue. It sounds like a great material and easy enough to carry a replacement piece in your spares kit. exactly mine is tensioned with similar fittings and appropriate eye at the quadrant. I think dynex dux would also do the trick. Lordy, Well at least I did not start an anchor thread. The engineer in me say regular galvanized steel will be stronger then stainless. Stainless means no greasy wires which is a big plus when I'm doing boat yoga in the lazzerette. I have a V-drive engine so the front of the engine is faceing the rudder post. Looks like I need to ponder this a little more. Galvanized for me. 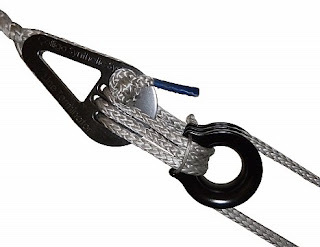 Wire rope is made from "improved plow share steel" (what ever that means). Think of all the cranes, elevators etc. that use this type of wire rope and the cyclic life it has. Why argue with success? As to maintenance, they make aerosolized penetrating grease but it can be a bit messy when applying. I agree, in addition, steel wire is stronger for the same diameter than stainless. I would only consider stainless if you have a major corrosion problem. [...] The engineer in me say regular galvanized steel will be stronger then stainless. 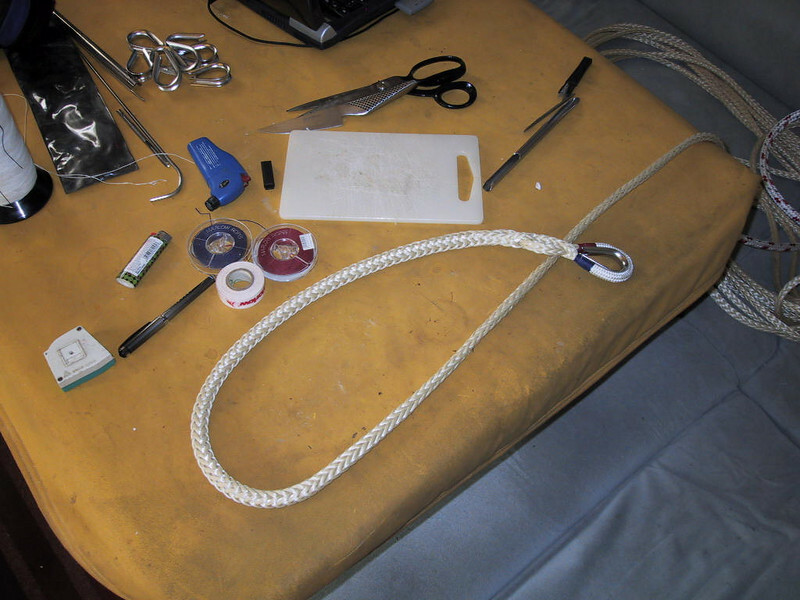 A splice in these synthetics can be done in seconds without tools... nothing like double braid horror... these are hollow-braids (single-braid) so you basically loop and burry the end inside the hollow tube. I would also say this is not cutting edge at all... think it's been around for 20 years at least. The only question sometimes put to the synthetics option is about UV damage... which you don't have with the steering cable!